Dump a password into keychain. I'm using the creator/kind codes "asbl" for Ansible, but you can use any 4 character code. It's useful for doing lookups later. $ security add-generic-password -a "root" -c "asbl" -C "asbl" -D "Ansible Vault" -s "ansible secrets" -w "secret123password456"
Installation procedure for pre-build actions to automatically populate Xcode Info.plist with dynamic data. 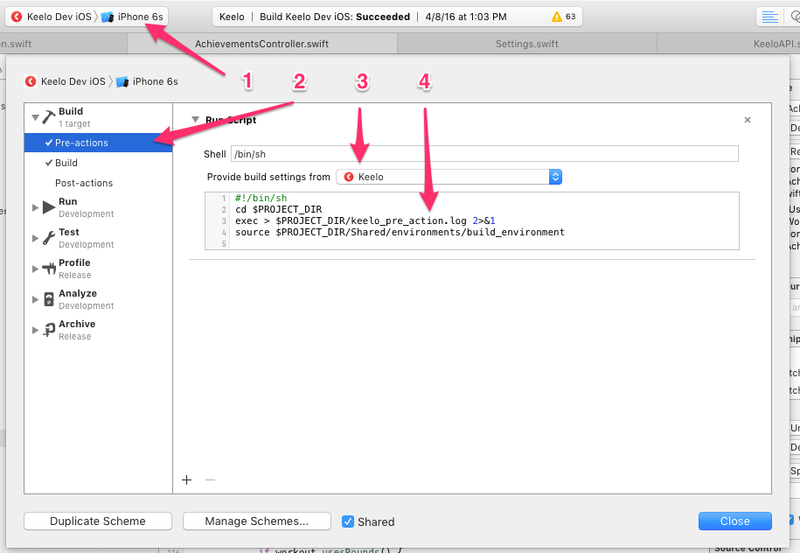 Edit Xcode Scheme and add a pre-action script. Copy the contents of preaction.sh into the pre-action script box. A kinda hacky script to set up iOS env config for RN, Objective-C, and preprocessor defines. This batch script will take a screenshot on an Android device using ADB, download the screenshot to the directory this script to the current directory and then remove the screenshot file from the device. Screenshots are saved with filename: screenshot-YYYYMMDD-HHMMSS.png. ADB must be connected to a device already.